I didn’t go into this race with the goal to win, although defending my title would be cool. 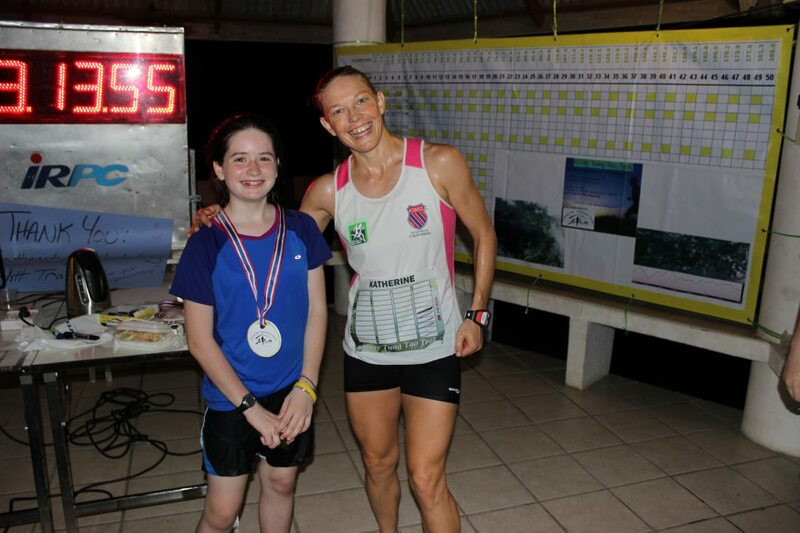 I simply had a goal to finish in 10 hours, and if that was good enough for a podium finish, then even better! The field of female 100k participants increased four-fold this year, with quite a few more foreigners signed up, so I had no idea how good my competition may be. 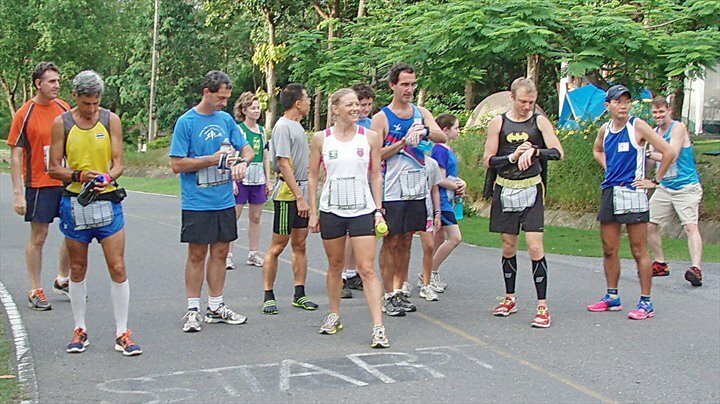 This year the race was held outside of Khao Yai national park and the course was much more interesting. with more variety of trails, fire road, and paved roads. 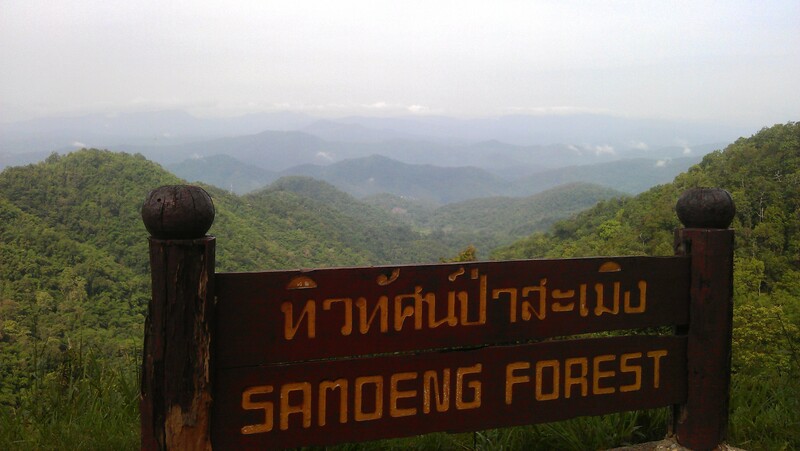 With some several hundred meters of elevation gain, it was not rigorous by ultra standards, but still difficult by Thai standards. Even so, the conditions proved difficult enough. The day was mostly overcast with temperatures only in the mid-80’s (F), but the humidity was still around 80%. Although balmy for Thailand, this still plays a factor in performance and strategy. final aid station – about 10k to go! The male champion finished in 9:47. My time was a very respectable 11:07, beating the 2nd place woman by 1:02 and good enough for 5th overall. The win and the time are also quite good considering I got lost twice and actually ran 103km (64mi)! The first time was early on when the lead pack got turned around in the dark – the course was not marked well! The second time occurred when I was running by myself on the second loop. My head was down, concentrating on the trail and I didn’t see the sign to turn right. 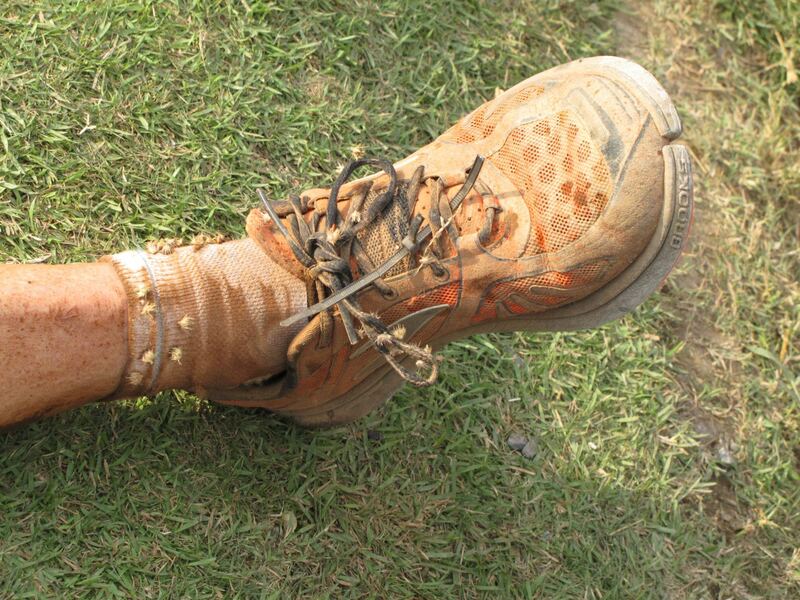 I only saw the race ribbons marking the trail going left, but these were for the 10km race. Since all the ribbons were the same color, I didn’t realize my mistake until I found myself on my way back to the finish line! This, however, became a source of consternation as the marshals, who do not take bib numbers but guide racers at certain points (of course not the point of my wrong turn), thought I cut the course. Of course I did not and had proof I did not, but at the time they didn’t know that and was followed by guys on motorbikes for several miles before the race director got them off my back. A-ya. At this point, I started sliding into the dark side. I was not only NOT going to make my time goal, but I could lose my first place standing. Combined with some nutrition issues due to drop bag malfunction; I thought I might just walk the final 25 miles. The “dark place” is something that ultra runners recognize and takes experience to be able to climb out of. It wasn’t until I took some more food, and was encouraged by a couple of guys I’d been running with through the day that I came through it and even burned brighter until the finish. The finish line had a paparazzi feel as I was surrounded with photographers! It felt great to finish, even better to win, but had not expected to be found in the celebrity limelight! I had flashbacks to Unbreakable, and thought, this must be what it feels like to be Geoff Roes winning Western States (not that I’m even close to his ability). 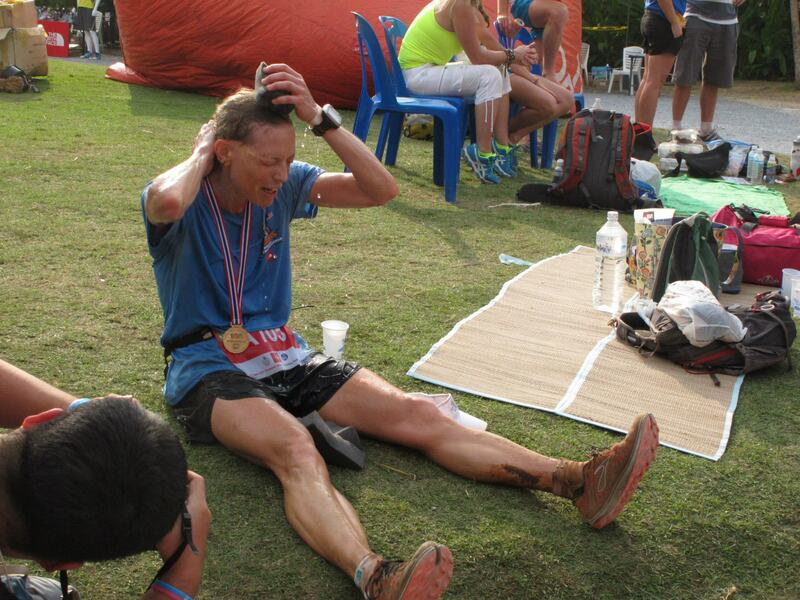 After I had had enough, I walked over the grass where I pressed sponge after sponge on my head and neck as I sat talking with my friends – I really wanted to hear about their own race experiences that day (they ran 50k). It is truly wonderful to finish a race and have friends greet you at the end! 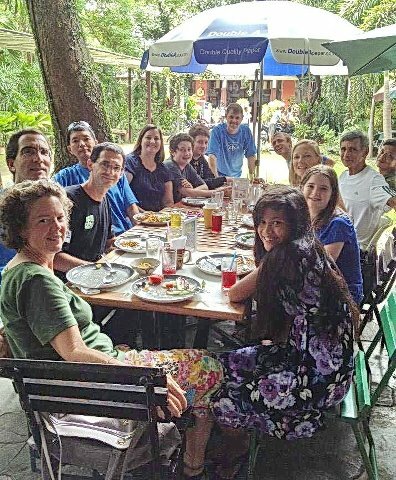 Thanks to all my friends for their support in my training and racing! Whether we run together in body or in spirit, I’m often thinking of you when I’m running! This is the first race that I have ever done twice. Will I repeat a 3rd time? Not sure… It’s a good race, but not THAT great. So many races and places and so little time! My confidence and ability is growing and there are other projects around Asia that I’d like to explore. Avoid drop bag malfunction – put plenty of food in each bag. The map of the course was confusing in that checkpoints weren’t labeled. I took the lady organizing the drop bags word thatyes, I’d be passing through check point #3 four times during the race, so I packed extra food in that one. Nope, it was actually #1. Oops. 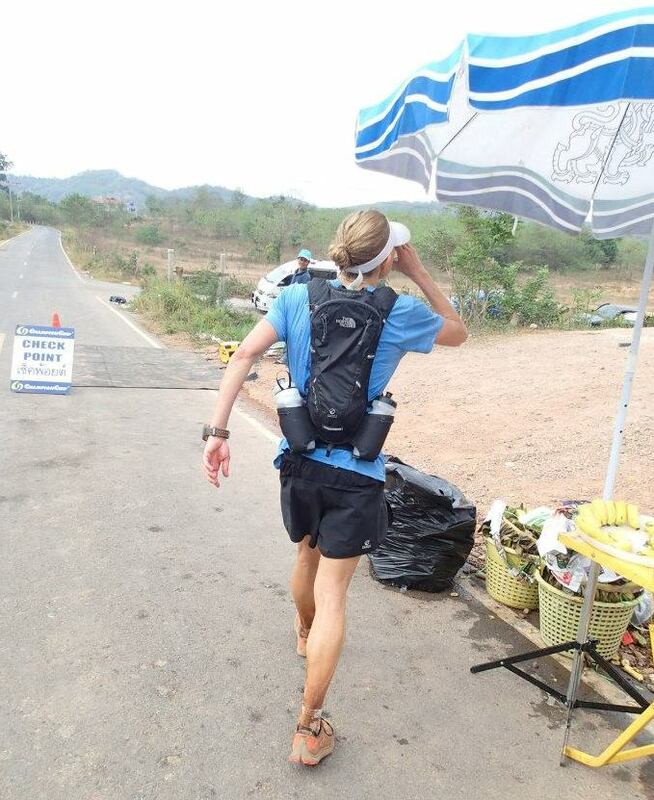 Aid stations at this race had only water, a Gatorade-like beverage, bananas, and watermelon (typical for Thailand). Therefore, to properly fuel for a competitive 100k race, having what you need in a drop bag is essential. 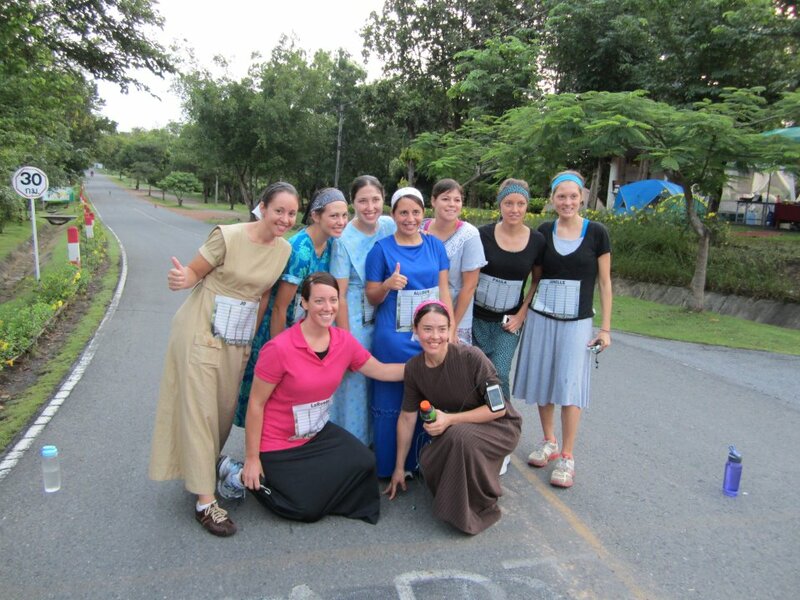 When the race is held in rural Thailand, don’t assume the resort at which the race is to be held will have any decent food to eat the night before. Needless to say, I didn’t start off with the pre-race fueling that I prefer! Don’t skimp on “time on feet”, strength exercises, or core training if you really want optimal performance. post-race massage: hurt so good! 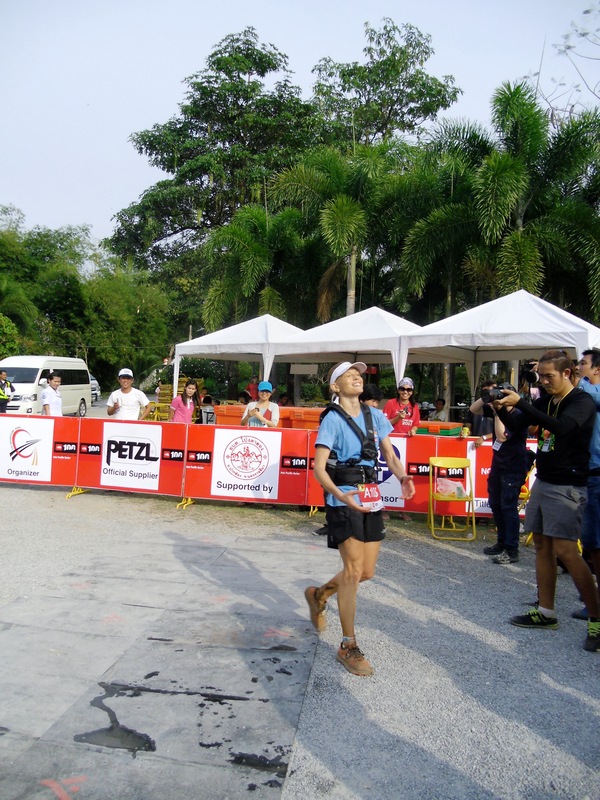 For those of you interested, my prizes for winnings included: 50,000 Thai Baht in vouchers to spend at The North Face Thailand store; Petzl aluminum compact trekking poles; Sigg bottle with special Thai design; a finisher’s medal and a ridiculously large trophy. 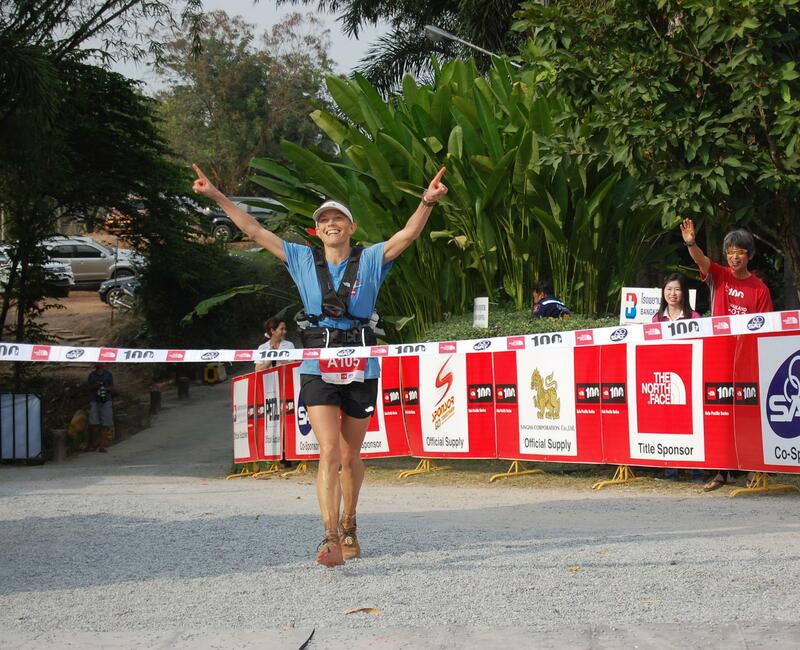 Categories: adventure and sport | Tags: Chiang Mai Ultrarunners Group, expat life, running, Thailand, The North Face 100 Thailand, ultramarathon | Permalink. The air hung thick and sweet. The full moon was overcast, not quite giving enough light by which to run, at least not enough to see any snakes or scorpions lurking along the road. Starting out in the wee hours of the morning, the only other thing that could trouble me now are the dogs. They become much more earnest in their duties in the pre-dawn dark. Running the Samoeng loop had been on my bucket list since I first heard of it a couple months ago. 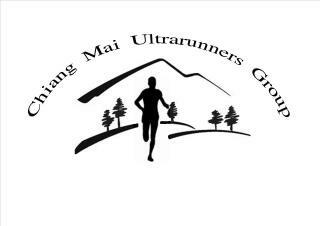 I thought that it would be a good adventure for the ChUG (Chiang Mai Ultra-runners Group) some day. However, faced with this “stay-cation” and not really sure how I would spend it, the idea burst into my conscious and I was so excited! This is the time! It didn’t matter that I decided only FIVE days before the decided date (Wed, 6 June) and that I had run 40 miles the Saturday and Sunday before – it was my fun run! I have a whole week of hanging out in Chiang Mai by myself so I might as well do something that I didn’t think anyone else would do with me. You could call it a different kind of road trip! My post-run relaxation plan was to check into the Shangri-la Hotel (at the local price!) for two days so I was especially motivated! I wish that my Garmin had been set up to record total elevation change ( both up and down) ran because I’m pretty sure it would impress some hard-core people out there. Here is a google maps view of the loop, with the terrain markings. If you have ever traveled in the Northern Thailand countryside, you get the idea. I left out the little loop of road that goes into Samoeng village proper, as I was sure that I had enough fluids to get me to the next village, Pong Yeang. I did manage, but barely. But I was pumped after seeing the sign: “Mae Rim 30km” at the 1096 turn-off and I didn’t want to take the extra time/distance into town. Yep, I’m gonna do this! The route was GORGEOUS! It was steeper than I had anticipated, less populated than I figured, but more gorgeous and stunning views than I imagined. The haze of morning burned off to give a clear blue sky with rolling clouds and heaven-sent breezes every once in a while. At the Queen Sirikit Botanical Gardens. I had a guard snap this shot. Long sleeves and a shirt under my hat helps keep me cool. At about 5.5 hours, I stopped at a mom & pop general store and took a break for some Coca-cola and potato chips. I loaded up on water and electrolytes in my backpack and bottles, changed my shirt (from tank to long-sleeve), and put on new socks. Feelin’ fresh! Plus, I was done with the serious hill-climbing, as it is fairly rolling until Mae Rim, when it becomes boring flat. 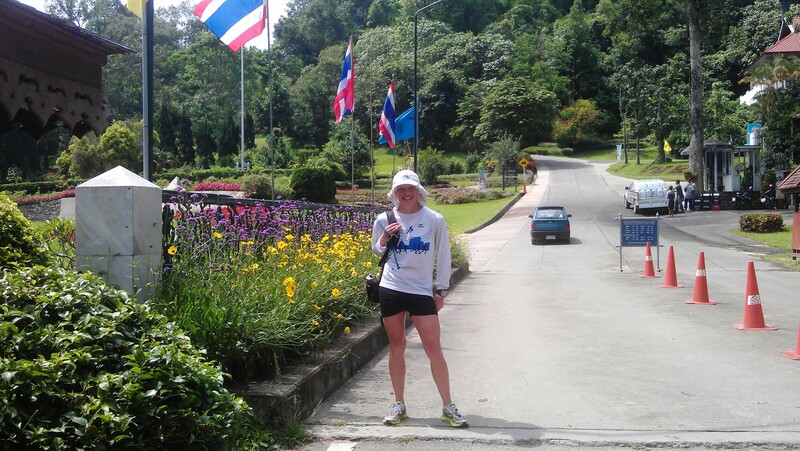 Running through Mae Rim down Highway 107 was demoralizing and quite a shock after the country lanes of the day. Two lanes of heavy traffic with barely a berm that wasn’t occupied by cars and trucks parked alongside, with no shade, and concrete surface – I had been on the road nearly eight hours and was not in the mood for this. The flip side is that I found a 7-11 for a re-fueling stop. I called a friend to try to get some encouragement, to see if I should quit or not. I really wanted to quit, or so I thought. I couldn’t get in touch with him and that was a good thing. He told me later would have picked me up and drove me home. After getting some water and Gatorade, stretching and getting my mind around it, I headed out. I wasn’t nearly in as bad a shape as I was at the 10-hour ultra last month, I wasn’t even cramping. Just very tired. So I started walking. I thought I would try hitching a ride, or flagging down a red truck taxi. Nobody stopped for me. A red truck came by, but I didn’t want to pay that much to get home. I kept going. Another one stopped, but through the negotiation I realized that I didn’t want a ride at all. I waved him off determined to finish on foot. I was going to DO THIS THING! I wasn’t going to DNF my own fun run! Sure, this fun run had no meaning and I wouldn’t even get a t-shirt, but it was my goal. I walked in the hot sun on a highway for the last 5.3 miles, stopping at another 7-11 and running only to make it through a green stop light. I walked up to my house. I had done it! Perhaps I am even the first to complete this on foot! Total distance: 50.4 miles/81.1km. Total time on the road, including stops: 11:54. DNF is not in my DNA. There is a good reason why we taper before races – fresh legs make a difference! Fill up with fluids if you don’t know for sure when you’ll get more. What you eat the two days before an event does make a difference in performance. 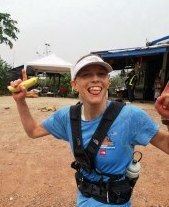 Categories: adventure and sport, Thailand | Tags: Chiang Mai, Chiang Mai Ultrarunners Group, running, ultramarathon | Permalink.